The “bible” of Moto Guzzi repair. Compiled by noted mechanic, Dave Richardson, this spiral-bound book is intended to supplement the usual parts and service manuals, and thus contains everything anyone could ever want to know – and then some – about the Italian V-Twins. 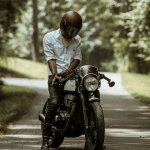 About the Author: Dave Richardson is a long-time motorcycle mechanic and owner of Seattle’s Moto Guzzi dealership, Moto International. Dave also writes “Ask the Wrench,” a technical column for the US Moto Guzzi National Owner’s Group Newsletter. Cycle World Magazine, June 1997 “Got a Guzzi? Get Guzziology! wBW Rating: Not yet rated.